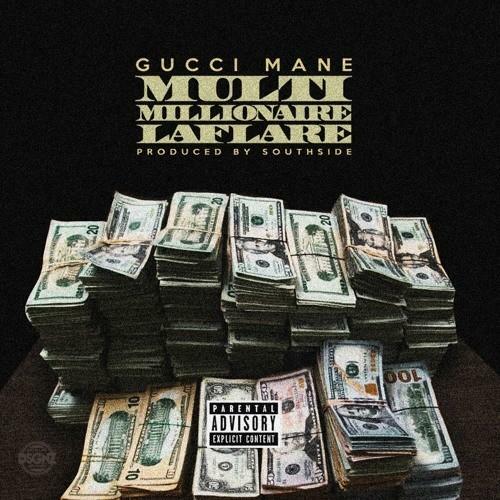 New single from Gucci Mane, "Multi Millionaire Laflare." If you're looking to become besties with Gucci Mane, unfortunately there is a pretty steep qualification-- you need to be a millionaire. Gucci says as much on wax with his new single, "Multi Millionaire Laflare," while also citing the millions he's whipped/moved. The song has screeching synth production from 808 Mafia's Southside. We heard him preview this song earlier today on Instagram, and we were more than ready for the CDQ. GuWop can do no wrong since his prison release, giving us some quality leaks as we await his upcoming album Everybody Looking. The album's due out on July 22nd, and alongside this latest leak, we've been blessed with "On Me," "First Day Out Tha Feds," "Back On Road" and "All My Children." Take a look at the tracklist for Everybody Looking here-- you'll notice that "Multi Millionaire Laflare" isn't listed on the tracklist, but perhaps it's still being updated because we've yet to receive an iTunes pre-order link. We'll keep you posted.